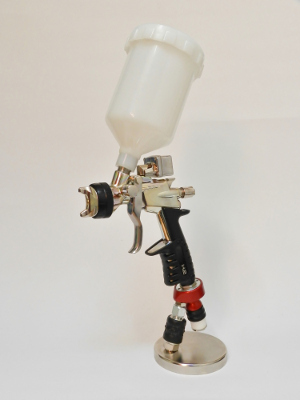 Super professional gravity feed spraying gun with HPS system and clickstep digital gauge where is indicated the air pressure and the temperature. There are no electrical heating components. The heating mechanism beeing fully pneumatic. Nevertheless the gun is ready to work in a very short time whitin 120 sec. Internal and external chemical nickel treatment, adapted for use with water based paints.